OUR NEW LOOK: For you VTA blog aficionados, surely you have noticed the new banner which now displays both the VTA and VaHBPA logos? 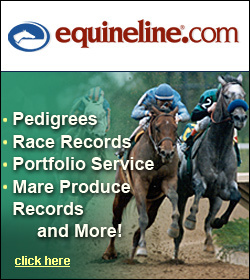 The two organizations have joined forces to make the Virginia Thoroughbred Blog the best source of relevant Thoroughbred news here in the Commonwealth. We’ve come a long way in a short time. Remember the old VTA Insider email? We also want to hear from you. We aren’t looking to turn this into a message board where a never-ending argument about how much a hot dog should cost at the racetrack is conducted, but we are wanting to provide interested parties a opportunity to be heard. If you have something to say about what has been posted here or you would like to share a story or an opinion, please write it down and email to us – vta@vabred.org. COLONIAL DOWNS HOSPITALITY: The meet opens on Friday and the fourth floor hospitality available to VTA and VaHBPA members is the same as it was last year. We will have a suite available on the fourth floor on Fridays, Mondays and Tuesdays. I’m not sure yet what it will/won’t cost to get to the fourth floor, but grandstand admission is free. The suite will not be available on the weekends, but Colonial has held several tables in the Turf Club for use by our members. Contact them directly to use them. Earlier is, no doubt, better. As usual, there will be separate events for Turf Cup day and the Virginia Derby. There will not be free hospitality on those days although Colonial Downs will still allow free first floor general admission to VTA and VaHBPA members on those days. We will be mailing additional info about those two days shortly. BREEDERS FUND: Remember we told you the VaHBPA contributed $200,000 to the Breeders Fund so we could pay year-end awards for 2008? VaHBPA Treasurer John Hanna wrote the check and we Fed Exed to the Virginia Racing Commission. They sent it to somebody down the line for deposit, so they could process the awards. Sounds simple enough. We expect to hear tomorrow a.m. that the check has either been deposited or it’s being sent back to us so we can deposit and pay out the awards. We will keep you advised and we appreciate your patience.